That first idea might seem great, but it’s definitely not your best thinking. Think of popcorn. The kernel is that first idea and many get so excited they even have an idea they just run with it – but someone, way back in history looked at that kernel and said ‘not good enough’ and then began experimenting with it. They mixed it with other ingredients, and eventually came across the magical combination of heat, oil & vigorous shaking that turned that useless kernel into popcorn. We should put all of our ideas through the same process, we need to try to break them, distort them, shake them and find that ‘magic’ combination that unlocks the true idea that they contain. And then let them rest before moving on. Let’s step back though, way back to before you even had the idea. Ideas are spontaneous, you never know when they might hit, as a result you can’t schedule a 30 minute meeting to have that ideals as we often do in a business setting. Once in a while you get lucky- but more often we end up grabbing the first idea that passes through the room and run with it. Profession athletes aren’t chosen at random from the stands like contestants on ‘The Price is Right’. They put years of work into perfecting their craft so when they hit the playing field they’re primed to make the kinds of magical plays that separate them from the rest of us. And they don’t come to the field cold either, they stretch, toss a ball around, get their heart pumping to get their body read before the game begins. This is where we most often fail when it comes to ideation and innovation though. We walk into a room and generally the conversation goes “Here’s our problem, how are we going to fix it?”, people throw some obvious ideas out, others respond with all the reasons x, y & z won’t work, and more often than not we walk away from the meeting promising to ‘check out x, y or z’ (usually to try and confirm why they won’t work. Just like in sports, having an great idea means putting in the effort to prepare your mind for the task ahead. Your brain fuels itself on information & intersections but you need to get it in the right state to accept those inputs. As you’ll see, the following suggestions are not something you can just turn on, you need to plan enough time to get warmed up, get your mind focused and also cool down & digest the outputs at the end of the session. 30 minutes is nowhere near enough time – you really need two hours or more, especially if you’re out of practice. Before people even set foot in the room they need to prepare themselves. This may mean reading some key articles, understanding the problem better or gathering other knowledge. All too often you get everyone in a room and it’s impossible to move forward because someone doesn’t have the knowledge they need to properly test an idea.I’m just about to do a day long session for a group at work where the preparation actually started back in November with a core group. We worked through a brief session back then to identify all the information they felt they needed to understand in order to tackle the problem properly. They’ve since met several times to share their research and knowledge in order to have everyone on a level playing field at the session. The biggest mistake I see people make is coming to meetings unprepared. Before coming into the room you need a strategy for how you’re going to approach the problem and help the people in the room think it through. If it’s a big enough problem, consider hiring a professional facilitator to come in and help you. At the very least, pick up a copy of Gamestorming as it’s full of techniques and approaches that anyone can bring into a meeting with great effect. Again, ideas are spontaneous and arrive on their own time, all you can do is create an environment that encourages them and prepare you and your coworkers brains to catch them.The best way I’ve found to do this is to approach the idea from a few different angles before tackling it head on. Figure out the characteristics and inputs that will affect this idea and focus on activities that help everyone in the room think about and understand those aspects better. As the session progresses capture the thinking on paper & post-its. Create artifacts and be sure to post them around the room. You never know what might get suggested early on that could be the important other half of an idea that gets suggested later. Every meeting has a ‘slam dunker’, the person who latches on to the first ‘good’ idea because they just want to slam the ball home as quickly as possible. 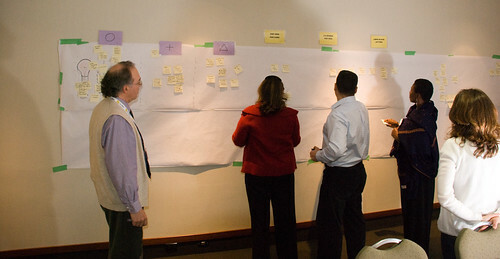 Design your session so you can test the ideas. Shred them, twist them, reverse them, break them and build them back up. You need to give yourself the time to really play with the idea. When everyone starts nodding together it’s time to attack the idea from a different angle. It takes time to do this right, with ideas there’s no quick fix – especially if it’s not something that people on the team are really expected to do on a daily basis. You need to nourish your brain in the days or weeks leading up to a session, giving it the information it needs to tune itself to the kinds of ideas you need. At the session you need to warm your brain back up and help it get focused on the task at hand. Finally, afterwards you need to give your brain the time to punt the idea around in your subconscious and think it through some more. There’s a reason people say they need to sleep on something. It gives the idea room to breathe and let’s you step back and reflect on it. Does it excite you still the next day? What ‘what-ifs’ did you think of over night that you missed while you cooked up the idea? A little distance is a great thing for an idea as you nudge it out of the nest and see if it can fly. Like any athletic activity, the more often you do it, the better you’ll get at it but it takes time & practice. Aside from a $20 copy of Gamestorming, every idea in this post is FREE. It just takes a little extra time to implement and do properly. And while scheduling a longer meeting (2,4, even 8 hours) may initially get push back, once people have seen how effective a little extra time can be they’ll get on board pretty quickly. The reality is, they already spend this time on a problem – just ineffectively and in fits and starts across multiple meetings. Good luck & happy ideating! A Great Webinar, Dave Gray is coming to Toronto! and VizThink turns 1! Next Next post: Idea: Combine Broadcasters, Social Media & Photosynth to capture live events.